One of the most relevant part of the orchestra is symphojazz. It is a combination of a symphonic orchestra and a jazz band. Stage, musical, jazz, rock, are not the full list of their opportunities. The first try of the orchestra in this genre became the musiacal “The bureau of happiness”, the first night of which took place in 1998. 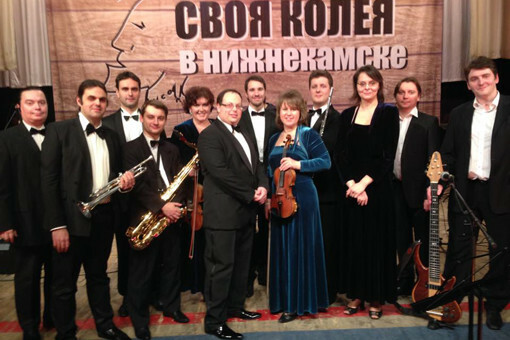 Ludmila Gurchenko, Alexandr Mikhaylov, Nikolay Fomenko, Alena Sviridova, Gediminas Taranda were performing, accompanied by Big Concert Orchestra “The bureau of happiness” under the management of Konstantin Krimts. Then there were performances at Ludmila Gurchenko’s benefit show “Farewell, the 20th!”, in the “Song of the Year”, at Igor Krutoy’s performances. Ones of the latest works of the orchestra in this genre were the concerts dedicated to the 75th Anniversary of Vladimir Visotskiy “I will return” which were a great success in Kaliningrad, Ekaterinburg, Kazan, Nizhnekamsk, St-Petersburg and Moscow.